Why take days to make pounds of ice when you can do it in minutes? With the Dometic compact portable ice maker, you can do just that. Preparing for a party is no easy task, but, with this nifty tool, you can sit back and relax. Still not completely sold? Luckily for you, we will be going over this portable ice maker from head to toe reviewing its features, advantages, and how it works. Let’s dive right in this Dometic HZB-12SA compact portable ice maker review! Note: The Dometic compact portable ice maker is currently unavailable but we encourage you to keep reading our review to be informed about the product when it gets back in stock. 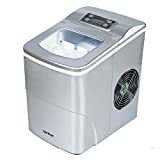 If you, however, would like to turn to another option, you can read about the Hamilton Beach portable ice maker which is a very similar option. Planning a big party? The Dometic HZB-12SA is here to serve your ice making needs. The last thing you should worry about is making dozens of trips to the store when you can just hit the on-switch, pour in some water, and watch her go! Not only is this portable ice maker made from a durable stainless steel, but it is perfect for outdoor or indoor events. It can even make ice in less than 13 minutes, not to mention 26 pounds of ice in 24 hours. Take a look at its unique LED display to easily turn on or off or adjust the cube size. It also has one of the largest compartments on the market for portable ice makers, nearly 2 full pounds of ice ready to use. The Dometic compact portable ice maker is truly something to behold. It can even make ice in less than 13 minutes, not to mention 26 pounds of ice in 24 hours. Take a look at its unique LED display to easily turn on or off or adjust the cube size. It also has one of the largest compartments on the market for portable ice makers, nearly 2 full pounds of ice ready to use. The Dometic compact portable ice maker is truly something to behold. Ice produced in one day: 26 lbs. This lightweight ice maker can be used almost anywhere, so long as there is a spot to plug it in. Keep it in your kitchen or put it in your outdoor bar area. It would be perfect to use in an RV as well, since it is fairly compact and uses an average amount of power to operate. Whether you’re preparing for a big party or just want your lemonade to be colder, the Dometic HZB-12SA will get the job done for you. Operating the Dometic compact portable ice maker is incredibly easy as well. All you need to do is plug it in, add water, and push the on button. The display screen will alert you when your ice bucket is full and when you need to add more water. With the push of a button, you can also choose what size ice cube you would like, small or large. Not only does this make using the machine easy, but it makes it even easier to get exactly what you want. One reviewer remarked that the ice maker is well worth the money. He bought it to use it in his RV since ice can cause a lot of problems when he is traveling. He said that it did exactly what it was supposed to do: ice. And it does it in such little time as well. There is one issue: he did not see a huge difference between the small and large size cubes, but otherwise it is great. Another reviewer said that, at first, he had some trouble getting it to work. He noted that the fan was not turning. He got it back up and running in no time. So far, he has had it for a week and no such trouble again. He uses the ice maker on his sailboat and the ice maker is ultra-efficient. However, he must periodically empty the basket into the freezer just so the ice doesn’t melt. He said that it’s a comparatively small inconvenience. Still, he would absolutely recommend this ice maker to all of his friends. No problems yet, said another reviewer. The Dometic compact portable ice maker worked exactly how it said it would. In fact, he said that even though it said it takes 13 minutes to make a batch of ice, his usually only took around 8 minutes. He said it was so much better than spending a couple bucks for bags of ice every day. As soon as he took it out of the box, he began making ice and there was no weird taste or smell at all. Recommended read: Still looking for more options? How about learning about other great portable ice makers on the market? The Dometic compact portable ice maker is the perfect fit for any social event or daily use. It can produce ice at an incredible rate and is overall affordable. With its easy to use interface and notification lights, it is a very simple and effective device to use whenever you need ice on any occasion. Not to forget its large removable ice bucket with insulation to prevent ice from melting. With the many functionalities of ice makers, this one takes the cake. It has an attractive stainless steel outer shell and looks perfect in any modern kitchen. Overall, a perfect tool for any family or event planner to use.